I first learned of the traditions surrounding Thanksgiving when I moved from Medellín, Colombia, to the United States 12 years ago. My husband, who was my boyfriend at the time, invited me to spend Thanksgiving with his family at his grandfather’s house. I still remember how cozy and warm the holiday felt to me. The table had a large spread of food, a beautiful turkey, traditional American sides dishes, and delicious pies. I did not grow up with the Thanksgiving tradition, but I’ve learned to love it. I am thankful for my husband’s family who usually host Thanksgiving dinner so that all we have to do is sit down and enjoy someone else’s cooking. Somehow everything tastes better when someone else prepares it! 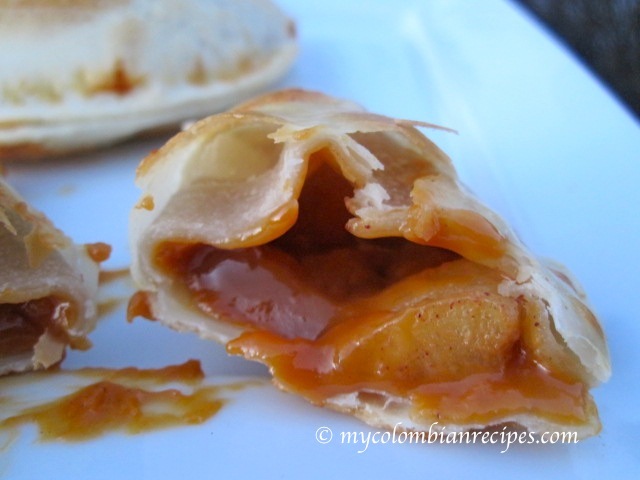 If you’re like me and are not hosting Thanksgiving dinner this year, but are still looking for a simple dessert to bring to dinner, this Dulce de Leche and Apple Empanadas is the perfect dish. While this may not be a traditional Thanksgiving dessert, it is easy to make, easy to transport, and absolutely delicious! Packed in cookie tins, these turnovers make a great host gift. 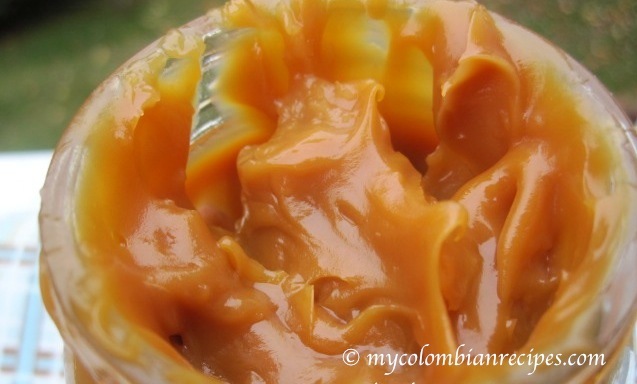 What is dulce de leche, you ask? Well, let me tell you about this addictive Latin American variation of Caramel. Dulce de leche is made from whole milk and sugar, cooked over low heat for a couple of hours into a thick, rich, creamy, and decadent golden syrup. 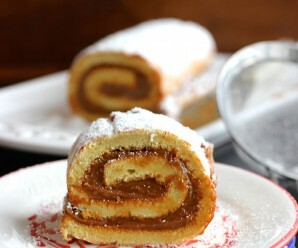 Canned dulce de leche can be found in the Latin section of most supermarkets, or just click here for my homemade recipe. Not being a huge lover of traditional apple pie, I’m always looking for variations of this dessert. 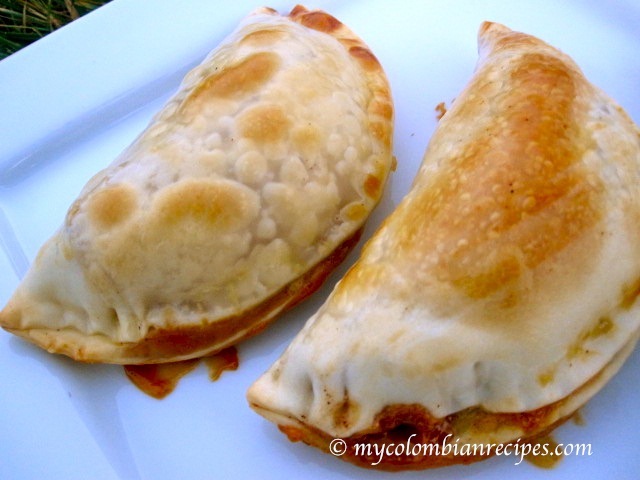 These empanadas definitely taste like apple pie, with just a little added caramel. The outside is crunchy, rich and buttery. 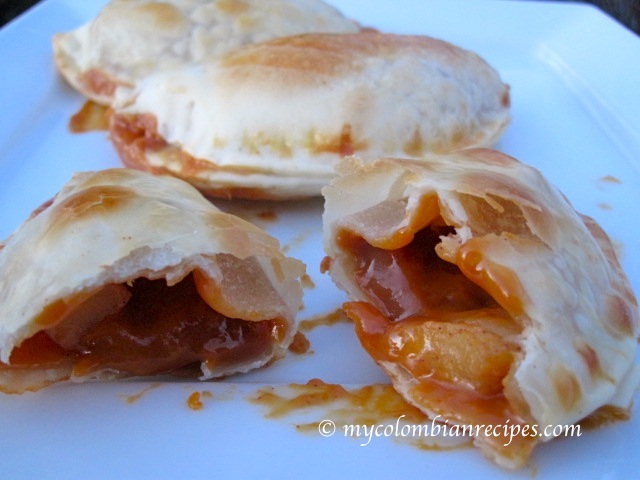 The filling is creamy and sweet from the dulce de leche, while the apples add just a little tartness. I hope you all have a fantastic Thanksgiving feast with the people you love. Eat plenty of great food and buen provecho! 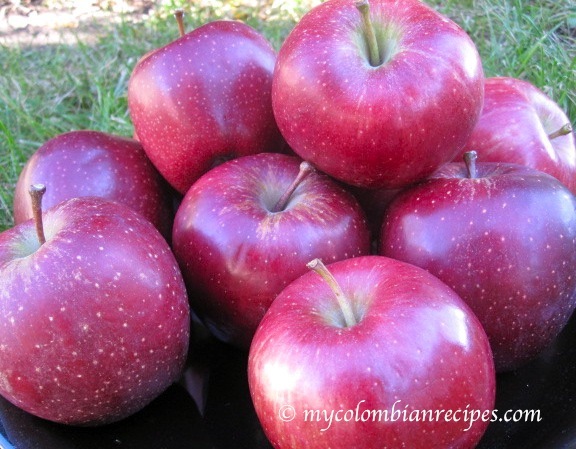 Place the apples, sugar, cinnamon, nutmeg and dulce de leche in a bowl and mix well. Mix the water and beaten egg in a small bowl. Set aside. 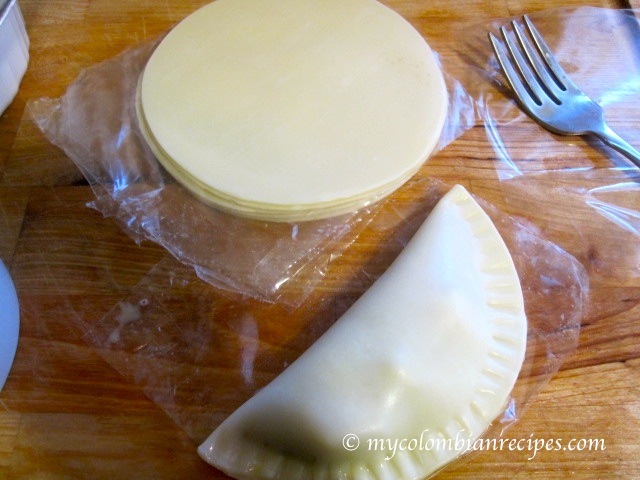 To assemble the empanadas spoon the dulce de leche and apple mixture on the center of the empanada discs. Lightly brush the top of each empanada with the rest of the egg mixture, this will give a nice golden glow when they bake. Place the empanadas on a cookie sheet lined with parchment paper. Let them rest for at least 15 minutes. Pre-heat the oven to 375 degrees F and bake for 15 to 20 minutes or until golden. I am going to try these. Gracias Erica! Happy Thanksgiving!!! These really look delicious and are so simple to make. I bet they taste amazing. Happy thanksgiving to you and your family. Looks delicious, Erica. Happy Thanksgiving to you and your family! Oh I like the dulche de leche and apple combo here. I would welcome them at my table. I do not celebrate either as the US does. In Canada it is not a big deal. But I would like to experience it once after your description of your first time. 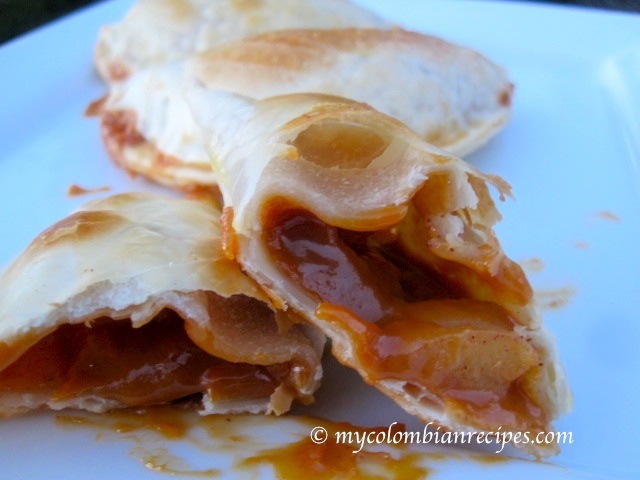 I love apples and caramel together but I bet dulce de leche would be an even more perfect pairing! Thanks for the comment, Joanne! what glorious images of that sweet, oozing filling! these are terrific, erica! Hi! I made these the other day. (you can see a picture of them here: http://instagram.com/p/SvGK3lFNBl/ ). I had some difficulty with them though. The Goya packages of frozen empanada discs only come with 10. So when I made the filling based on your ingredient list above I had WAY too much leftover. And also I couldn’t quite fit enough filling in each disc and also get it to close so when they baked they puffed up and were a little empty. And I baked them for the full 20 minutes and the dough was still a little raw. I let them bake a bit more. I wonder if these would be good fried? Mine oozed a lot and I took out the sugar from your recipe as I thought apples and dulce de leche together were sweet enough ( and they ended up being quite perfect just as is!). Any advice on how I can make these without the leakage, with more filling and with better cooked dough? better.Yo can cook them longer next time…..every oven is different! I did brush the edges with egg-water mixture and I pinched them closed with a fork. Still got a lot of leakage and couldn’t fit a lot in. I’d rather not make the dough if it’s readily available at my grocery store in the Goya section. I made these empanadas with the large Goya discs and they were perfect. Delicious and they were a hit.thanks. 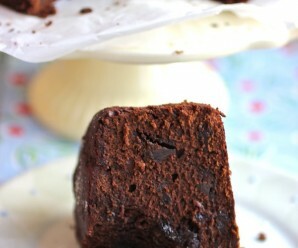 Hello your items I find interesting, I visited your website and I noted some recipes. From Spain I invite you to visit my blog Valencia kitchen every week I updated, is very positive about other food cultures. Por cierto, en mi restaurante hice algunas de tus recetas, pues tengo muy buenos clientes de colombia, me encanta tu cocina, proximamente colocare en mi blog alguna receta similar a las tuyas pero de caracter tradicional de valencia, como el esgarrat, la pericana o las cocas de maiz. Your empanadas look delicious, what brand of empanada disks should I use? Any tips to keep them closed? Place them in the fridge for about 30 minutes, before baking. Did you add enough egg to close them?